With spring just around the corner, we got antsy to do some homemade spring cleaning inside so that by the time spring is actually here, we can enjoy being outside. Of course, we wanted to use our own DIY homemade cleaning products. Why use homemade cleaners? Well, it’s true that some germs can be dangerous. But so are the chemicals in commercially-purchased cleaners. And it’s inexpensive and easy to make cleaners at home. 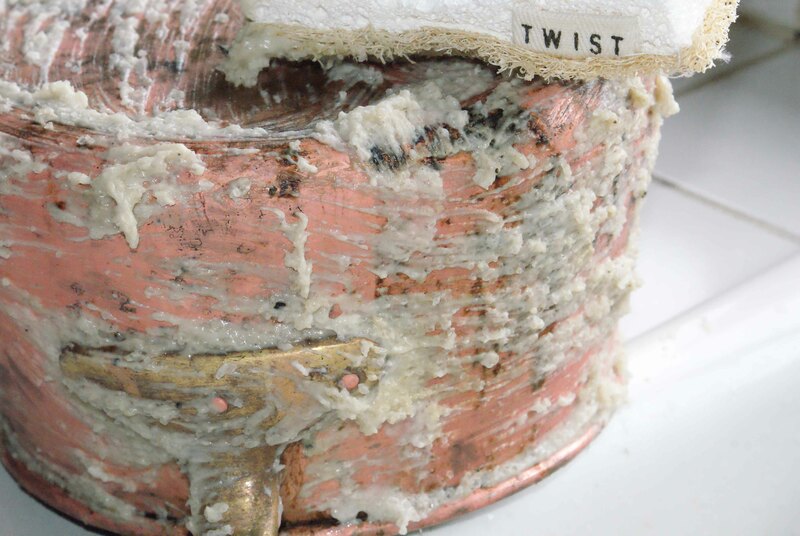 Here’s another reason for making your own cleaning products. Did you know that household cleaning products aren’t required to list their ingredients? They’re only responsible for doing so if an ingredient is “caustic, toxic, an eye irritant, or if the chemical make-up of the product could pose such a hazard.” This means you may be cleaning your homes with chemicals you wouldn’t normally use. 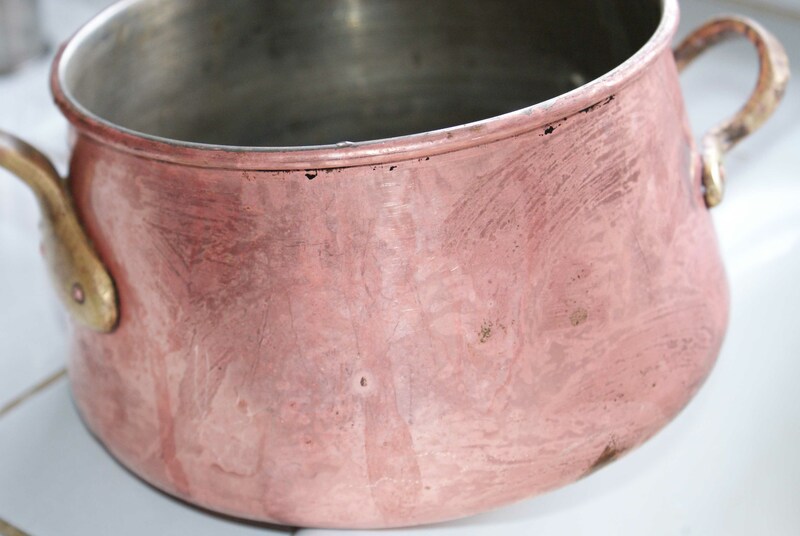 With these concerns in mind, we made our own all-purpose citrus cleaner, herbal baking soda scouring powder, and salt polish for our brass and copper pots. You’ve probably heard that vinegar is a great non-toxic cleaner. 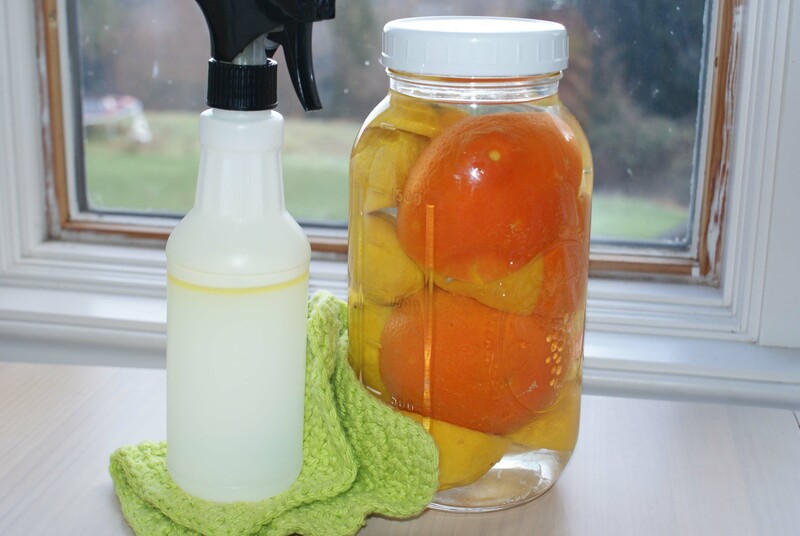 But did you know you can make your own citrus-scented vinegar cleaner? Just put citrus peels in a jar, along with some essential oils, and cover with vinegar. Let it steep for two to three weeks, and then you’re ready to clean with your own citrus cleaner. 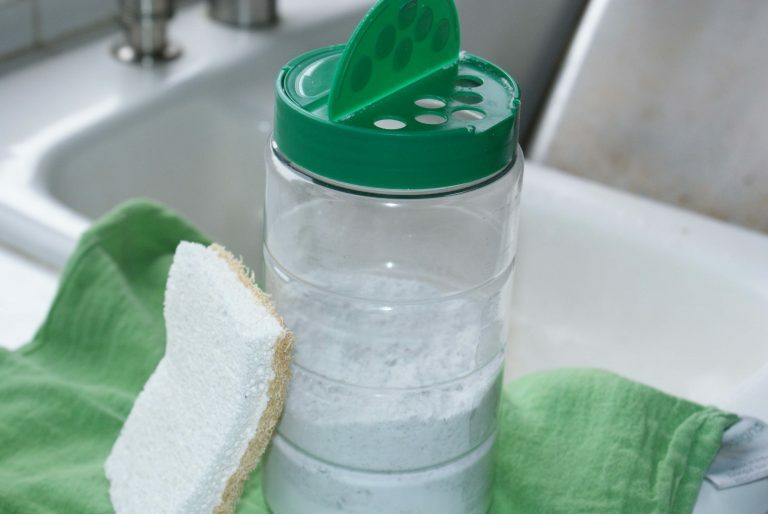 You can make an herbal baking soda scouring powder to use to scrub your sinks, showers, and tubs. You can make your favorite scent. 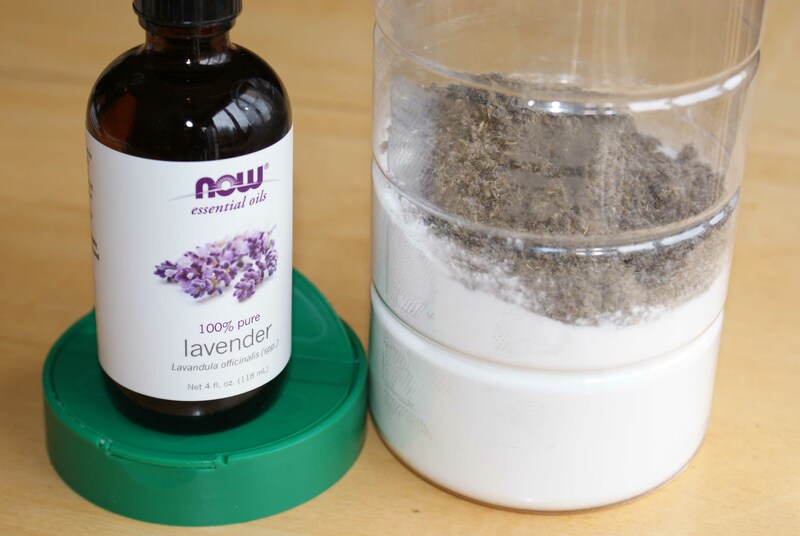 All it takes is baking soda, ground herbs, and essential oil. 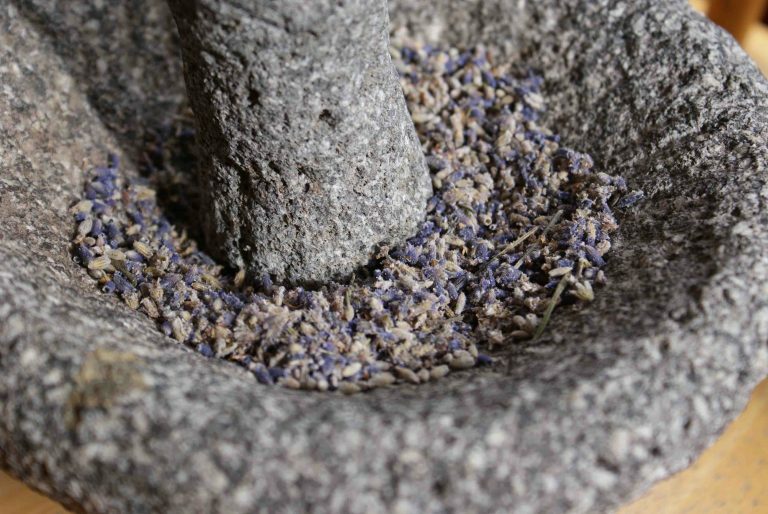 We made ours with ground lavender . . .
. . . and lavender essential oil. Now we’re all set to scour our sinks! Note that we used a recycled Parmesan cheese container to hold our scouring powder. Good old salt is an effective, yet gentle scoring powder. It has many uses when it comes to cleaning. 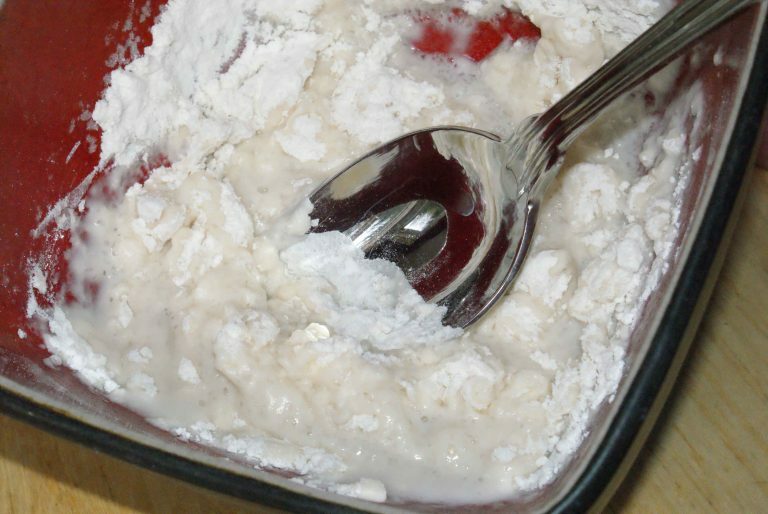 One of our favorites is to mix equal parts salt, flour, and vinegar to make a paste. This paste is great for polishing brass or copper. Rub the paste on the metal. Clean it off with a soft cloth. Look how much better that pot looks! This no-streak window cleaner contains an unexpected ingredient: cornstarch. The cornstarch is the key to preventing streaks. 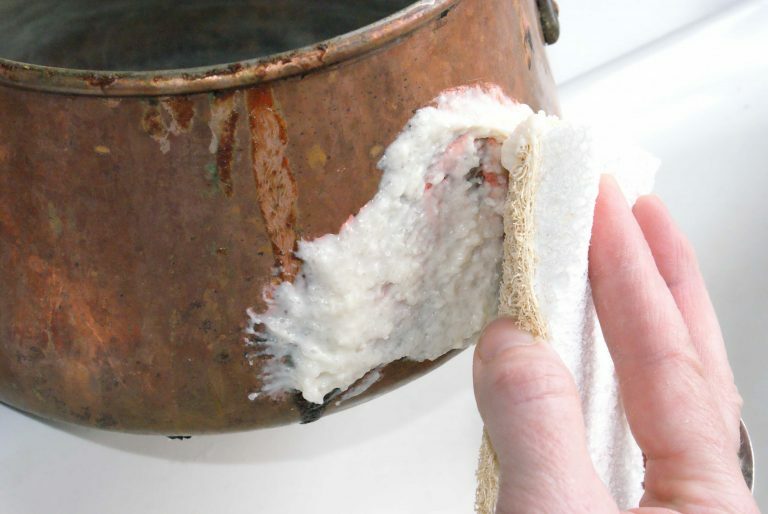 Baking soda, Castille soap, and water make a handy all-purpose cleaner. Add a few drops of essential oils to give it your favorite fragrance. You don’t need a separate cleaner for each different cleaning job. You can replace them with five simple ingredients: white vinegar, baking soda, hydrogen peroxide, Castile soap, and natural dish soap. If you want to get a little fancier with your DIY cleaners, you can make inexpensive custom-scented bathroom cleaner, toilet bowl cleaner, furniture polish, glass cleaner, all-purpose cleaning spray, stainless steel cleaner, homemade dishwasher detergent, floor cleaner, laundry detergent, and fabric softener using these ten ingredients: white vinegar, baking soda, lemons or lemon juice, salt, olive oil, Ivory bar soap, liquid dish soap, washing soda, borax, and essential oils. Just in case you don’t have enough to get you started, here are 67 homemade, all-natural cleaning recipes. Next Post Lets Get Cultured!